An Academic Integrity Committee (AIC) has the responsibility to administer and advance strategies in support of academic integrity. The AIC can sustain its membership by recruiting leaders of the school community, which might include--administration, faculty and students, as well as parents and other interested community members. The AIC will write and implement a strategic plan to organize their activities to sustain their mission. Role, procedures and guidelines for an Honor Council. 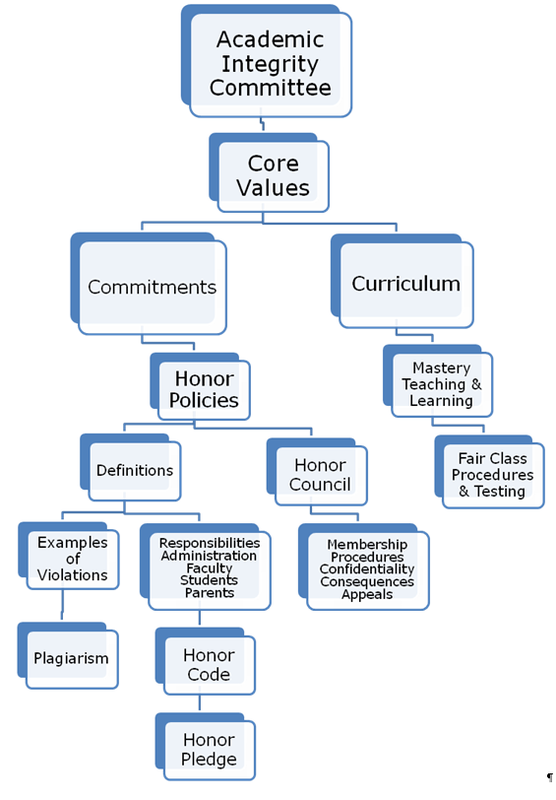 An Honor Code briefly summarizes the school’s Honor Policy, which defines the expected standards and core values of student conduct in academic affairs. The Honor Code can be published in the Student Handbook and school website. The purpose of an Honor Code is to communicate the meaning and importance of academic integrity to all members of the school community. An Honor Pledge is a one to two sentence statement that students may write or state orally to affirm their support of the school’s Honor Code. An Honor Pledge may also be written to focus singularly on a completed project or exam. ​An Honor Council can be responsible for reviewing specific cases in which the school’s Honor Code may have been violated. The Council can make recommendations about consequences to the school administration. If students are involved on the Honor Council, the Council can be an important collaboration between the students and adults to support the goal of academic integrity. The Honor Council may be organized as an extra-curricular service activity for students. An Honor Council is not a court of law and acts only as a communication, review, recommendation, and education service of the school. ​During the spring/summer of 2008, SEE completed a search of US public and private school websites that included references to academic integrity/honesty/cheating and/or honor codes or pledges. We specifically searched for schools that represented a broad geographic diversity. There were 93 school websites discovered, which were ultimately sorted down to 33 websites of schools that included definitions of cheating and published integrity policies and/or codes supporting integrity. Of these 33 schools, 19 were public schools and 14 were private schools from a total of 16 states. We created an outline of a model academic integrity policy from a review of these 33 schools. We obtained permission from 14 school administrators from nine states to include policy narrative or themes and cite their websites to create SEE’s synthesis of an academic integrity policy. No single school website contained all of the elements of this policy and several schools may have contributed concepts to individual themes that were synthesized and paraphrased in this document. Michael Pirhalla served as SEE’s intern to complete much of the research to identify these schools.